The Richway Alkal-Life 7000 SL is the latest in water ionization and purification technology, producing alkaline water straight from your faucet's tap water. Alkaline water is a powerful antioxidant that is more easily absorbed into the body than regular water and neutralizes free radicals, which cause us to age faster and are largely responsible for many diseases, including cancer. Alkaline water is ionized water, which increases hydration as well as maintains and balances our body's pH, which deters bacteria, inflammation and disease. The Alkal-Life is also voice-activated! Making the decision to convert to alkaline ionized water is the first step. The second step is ensuring that you have the best water ionizer available...and at an extremely affordable price. Alkaline water can prevent diseases like cancer. 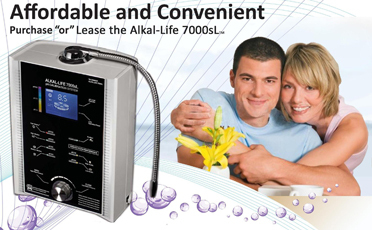 The Alkal-Life 7000 sL is the first water ionizer to have a computerized system that monitors all types of incoming water and automatically calibrates the machine to provide the pH level you have selected. So wherever you live, from New York to California to Australia to Africa and Asia, the 7000 sL instantly recognizes the quality of your tap water and the advanced calibration system guarantees the highest quality ionized alkaline water. The Alkal-Life System plugs right into your wall and comes with a universal faucet connector that will switch between tap water and Alkal-Life water with the pull or push of a lever. It has buttons that let you choose between Alkaline, Purified or Acidified water, all of which have their separate benefits. Learn more about how the Alkal-Life System works. See how the Alkal-Life stacks up to the productivity of other name brand water ionizers. 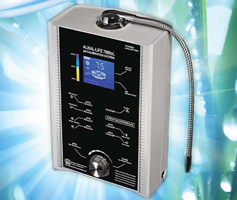 Alkaline Ionized Water contains many Hydroxyl Ions, which remove free radicals. Free radicals are unstable oxygen molecules that cause damage and disease to our body. Once the Hydroxyl antioxidant and free radicals have cancelled each other, the result is the body is supplied with extra oxygen and energy. More energy equals more activity; more activity means stress relief.